I felt like a kid at a birthday party opening the much-awaited Osprey Mutant 38 alpine climbing pack. It looked sleek and streamlined online, and now I was about to ground-truth my expectations. As an alpine, ski, and rock guide, I have accumulated a respectable quiver of packs. Backpacks are one of the Achilles heels of guiding: I reckon that I wear a pack of some sort for well over three-quarters of a calendar year between guiding and recreating, so form and function are of utmost importance, and I have little tolerance for uncomfortable and poorly-designed packs. The Mutant 38 is designed as a lightweight alpinist pack, and I was able to test its function while alpine guiding on Mt. Hood, as well as taking it on a three day ski mountaineering journey to ski the two highest peaks in the Boulder Mountains in central Idaho. The shoulder straps are constructed with a swiss-cheese-like-foam sandwiched between front and back mesh, and are a nice width for alpine climbing. I found them to be breathable and super comfortable. The back panel shares a similar construction, with a mesh layer floating on top of textured foam, presumably to keep the dreaded back sweat to a minimum. While all my testing environments were in the snowy alpine, I did notice the lack of pressure from the pack on my back kept me relatively less sweaty. The waist strap is minimally padded while still retaining functionality. Both sides have a gear loop, and three slots for ice-clippers or carabineers. The waist belt is fixed, and some might want the “seat-belt” style strap found on other alpine climbing packs, but I generally prefer this in most alpine situations. The side compression strap is comprised of a single strand of nylon that makes a “W” on the side of the pack, and is is adjustable from buckles on both the top and bottom. The center of the “W” is “fixed”, but is adjustable if one wanted more material on the upper and lower half. I initially adjusted the compression strap at this point to tailor my need, and have since left it fixed in place. The Mutant 38 comes equipped to handle two ice tools/axes, which are affixed by a metal T that runs through the hole on the head of the tool/axe, and a quick release/tension system higher on the pack. There is a place to slot the picks through in the bottom center of the pack to keep them at bay. In the user manual, Osprey states that the Mutant 38 comes with loops where the user can affix a crampon attachment system of their choice. This is my only real complaint with this pack. I expect a high- end alpine climbing pack to come with this system in-place since crampons are an essential tool for the alpinist. I ended up looping 3mm cord through the fixed loops and stealing a crampon holster off another pack for this system. The other issue that I had with this part of the pack is the lack of a more durable material where the crampons are stored. I felt that it was necessary to keep my crampons in a bag while on the outside of the pack as to not tear the material. A minor flaw, but a flaw indeed on this otherwise well thought-out pack. The lid/closure system on this pack took a little getting used to, but now after a number of days with the Mutant 38 on my back, I’m psyched. The lid on the pack is easily removable and the height is adjustable via the 4 attachment points. This is a big plus, as I won’t use an alpine pack with a fixed lid. The other really cool thing about the Mutant 38 is that it has a flap that goes over the opening into the pack when the lid is off. I find that when I’m climbing, I take the lid off, using it as an organization pocket that lives in the pack, and pull the flap over the pack opening. Under the flap, there is a rope catch, and when the flap is closed, the rope strap and center of the rope sit securely. This becomes a little more awkward when the top lid is on, but it’s not that big of a deal. I keep the top lid on with a full pack going into basecamps, as it also has a helmet bra to secure a helmet to the top of the lid. There seem to be the appropriate number of pockets for an alpine climbing pack; one small mesh one under the flap, a standard one for the lid, and a hydration pocket against the back in the main compartment of the pack. Nothing more, which keeps the pack functional and streamlined. First off, I have to say that I really like this pack. As with all outdoor gear, there is lots of hype surrounding specific types of products. I owned a specific alpine climbing pack for a number of years until it was beyond repair. It seemed to be the “brand-du-jour” within the alpine climbing community, and I tried really hard to like it, but I never really did. The Mutant 38 is another story all together. I was very impressed with how comfortable this pack is, both with a load that was probably too heavy for it, as well as when it wasn’t packed full enough. Going into the Boulder Mountains on a ski mountaineering mission, I almost used the full capacity of the pack. I was impressed that 38L could hold a full skimo kit plus food and fuel for our three day mission. This was impart due to the extendable skirt, but also due to the well thought-out form of this pack. The helmet stored nicely on top of the lid, and I wasn’t worried about destroying it, skis slipped nicely into the compression straps on the side, and I was even able to get our 30m skinny rope inside the pack on the way in. On the way out, I draped the rope through the under-lid rope catch and it slid nicely into the compression straps next to my skis. While I did feel the weight, I was impressed that this pack handled it as well as it did. I’ve had other similar sized packs with beefier suspension and padding that didn’t carry a load as well as the Mutant 38. Using this pack in its designed function, as an alpine climbing pack, I was psyched. It climbed extremely well both full and half-full. I have had packs that felt atrocious when their volume wasn’t used- this was never an issue with the Mutant 38. In fact, most of the time, I didn’t ever feel that it was there. This is a huge benefit on harder pitches: I was able to stay focused on the climbing instead of cursing the pig on my shoulders. It was fluid and comfortable. The Mutant 38 held all my gear well while climbing. I was never worried about my 2nd tool swinging off while on my pack, and snow pickets nestled nicely along the side and were easily retrievable without taking off the pack. As mentioned above, an equipped crampon attachment system is lacking, but allows the user to custom tailor it to their needs. The gear loops and ice-clipper slots on the waist belt were welcomed and helped gear organization while climbing. The size of the pack and the lid/flap options up top allow a customizable experience based on the objective. When alpine guiding, I often have much of the rope stacked in my pack, and ready to pull out based on terrain dictation. I like how I could simply cover the opening of the pack with the flap without cinching the drawstring, allowing me to pull the stacked rope out of the pack, with pre-rigged knots and all. In closing, I must reiterate how psyched I am on this pack. I found it to be more than adequate for ski mountaineering, although its technically outside of its designed use, and found it to be the best alpine climbing pack that I’ve used to date. This pack will undoubtedly replace my similar-sized alpine pack, for both recreational objectives as well as during a long summer of alpine guiding in the Oregon and Washington Cascades. 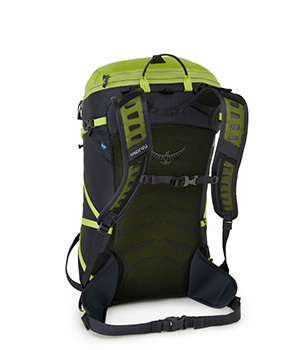 Shop Osprey on Outdoor Prolink. Not a member? Apply today! Chris Marshall is an AMGA Certified Ski Guide, AMGA Assistant Rock Guide, and AMGA Apprentice Alpine Guide. Chris spends his summers alpine guiding for Timberline Mountain Guides and Mountain Madness and winters guiding backcountry skiing, ski mountaineering, and teaching avalanche education courses for Sun Valley Trekking. Chris has 10 years of experience teaching and guiding throughout the west and Alaska. Hi Lothar, It’s hard to say as this is a winter pack designed for cold weather pursuits — however, never hurts to give it shot! I have used it as a summer crag pack, and it functions just fine.